Abhayjeet Singh Sachal shares how he juggles speaking engagements, classes and non-profit work. International speaker, environmental advocate, non-profit founder, hockey player, piano teacher. Abhayjeet Singh Sachal has done it all. And he hasn’t even finished his university applications yet. The Grade 12 Seaquam Secondary student has already had to balance both lives in the two months since school started. Already this year, Sachal has flown out to Toronto to accept the WE Prince of Wales Youth Service Award from WE Day founder Craig Kielburger and given a 45-minute talk at the annual North American Association of Environmental Education conference in Spokane, Wash.
Because of that conference, Sachal has started working with teachers in New Zealand and the United States to create new chapters for Sachal’s non-profit Break the Divide, an organization that aims to help youth become personally connected to global issues. It’s a lot of work — even Sachal admits that — but it’s a lifestyle he’s long been preparing for. That has been the case since Sachal was little. In elementary school he would always volunteer to speak during a presentation or represent his class in school assemblies. Often, he was chosen to take on those roles. When he was 11, his parents put him into a youth Toastmasters club to help him develop his oratory skills. It was that club that helped launch his real interest in public speaking, Sachal said, and its first test came when he was 13 and decided to apply to give a TEDxKids@BC talk in Vancouver in 2013. Over that summer, Sachal worked to develop his talk with the help of a professional public speaking coach, courtesy of the TEDx team, and gave his speech at the TELUS World of Science. Sachal was born in India, but moved to Canada with his family when he was just 11 months old. Growing up on the Surrey side of Scott Road, Sachal remembers going for walks with his dad in Watershed Park. Entering high school at Seaquam Secondary, Sachal joined the school’s “Green Team,” an environmental club led by teacher Michael Iachetta that focuses on sustainable initiatives. Through Sachal’s involvement with the Green Team, he’s participated in the Young Reporters for the Environment competition, which led to him attending the World Environmental Education Congress in Vancouver in 2017 with four other Seaquam students. The year before, Sachal applied for a scholarship to participate in Students on Ice, a foundation that aims to educate youth on the importance of the planet’s polar regions through group expeditions. He received a $12,000 scholarship to go on the excursion, which took him and 120 other students to the Arctic for a three-week trip. That 2016 trip to the Arctic was a pivotal moment for Sachal, and resulted in a connection between his interest in the environment, public speaking and public health: Break the Divide. “For me personally, it kind of brought this personal significance to me,” Sachal said about the trip. When he was in the Arctic, he saw first hand the environmental changes that were affecting the landscape, and also learned about the public health concerns that were impacting students in the North — like a suicide rate that was 11 times higher than the national average. “That was my biggest thing coming back from the expedition,” Sachal said. “Sure, all these things are going on, but why doesn’t anyone know about them and why doesn’t anyone talk about them? Sachal and his brother Sukhmeet Singh Sachal founded Break the Divide to do just that: promote global awareness in youth just like them. The non-profit works something like an electronic pen pal system, connecting students from around the world. Through Break the Divide they can share stories and ideas, and also work together to foster social change. Although the program started with a single connection between Seaquam and Inuvik’s East Three Secondary School, it has now grown to eight different chapters around the world. Each of these chapters is working on different ways to tackle issues facing teens today: climate change, reconciliation, youth violence, the foster care system, mental health and disabilities. With Break the Divide taking off, Sachal has found himself travelling around North America championing the foundation. He’s also worked to support the non-profit as it continues to grow and gain new chapters around the world. His work with Break the Divide comes on top of his international baccalaureate program in high school, his practices with the Surrey Knights hockey team, his lessons teaching students the piano and his time with friends. How does he do it? “I lose a lot of sleep,” he said, then laughed. It helps that he uses his activities as a form of relaxation, he said. 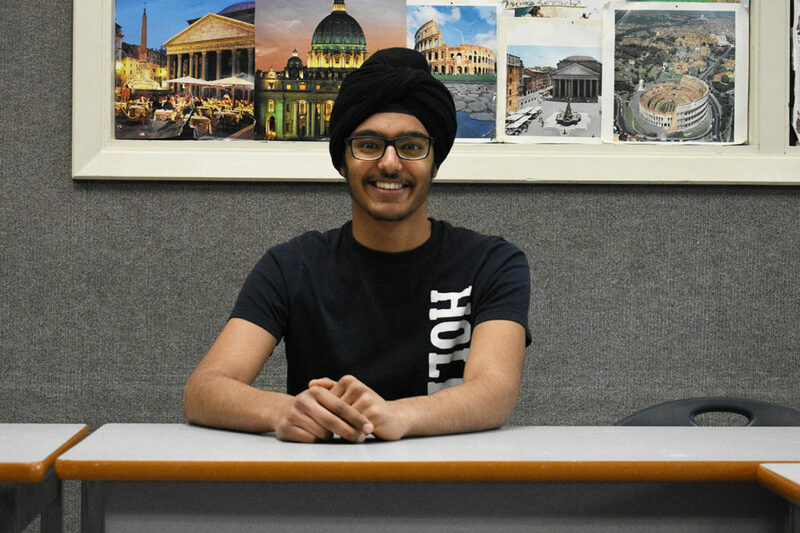 Taking advantage of free time is going to be crucial for Sachal in the coming months, as he still has two conferences to go before his IB exams in January. On Nov. 3 and 4, Sachal will be in Toronto with his brother to talk about the need for intercultural dialogue at the Parliament of World Religions, an international event that brings in speakers to talk about how people can create a more just, peaceful and sustainable world. At the event, the Sachals will be discussing Break the Divide as a keynote speaker. His name is listed alongside other major speakers such as Margaret Atwood, former prime minister Kim Campbell and Dharma Master Hsin Tao. The event is expected to have 11,000 delegates — the largest conference Sachal has ever attended. When Sachal comes back from the Parliament of World Religions in November, it will be time to prepare for one more conference and then buckling down to studying for those January exams. Right now, Sachal doesn’t have any jet-setting opportunities booked for the spring, meaning he’ll have time to focus on his hobbies before his final exams in May. After that, it’ll be time to take the plunge into university — hopefully as a science student, so he can one day take a public health approach to solving issues of climate change. “Everyone can connect to health, because it’s something we all care about on a daily basis,” Sachal said. “And if I’m able to learn more on that, become a professional in that field, I can probably make the biggest impact.